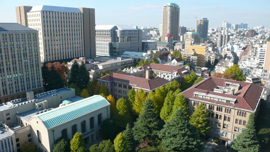 Waseda University is one of the oldest private universities in Japan. It began life in 1882, when Shigenobu Okuma, a prominent politician with a passion for education, founded the Tokyo Senmon Gakko. 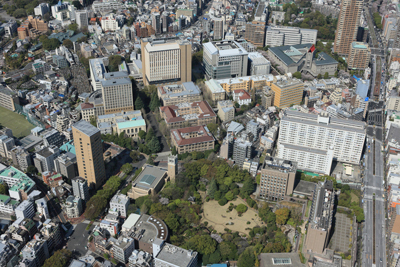 Waseda University has provided first-class education for almost 130 years, based on three founding principles: independence of learning, the practical utilization of knowledge, and the creation of good citizenship. Today, the University comprises 13 Undergraduate Schools and 21 Graduate Schools, and is the foremost private university in Japan. 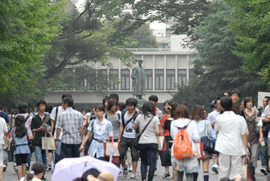 Waseda University is particularly notable for the contributions it has made to Japanese society. Waseda University has produced many leading politicians; the School of Political Science and Economics is one of the original Schools of the University, and the Waseda University Yubenkai, or Oratorical Society, counts among its past members a large number of distinguished politicians, including six Prime Ministers, and political journalists. Waseda University is also the alma mater of Mikio Oda, the first Asian athlete ever to win an Olympic gold medal. This is testament to the strong tradition of sport at Waseda University, which boasts many world class athletes among its alumni. Excellence in sport is not limited to the field of competition; the School of Sport Sciences was established in 2003, and is a hub of first class education and research into sport sciences, from health science to sports business. In recent years, Japan's Ministry of Education, Culture, Sports, Science and Technology (MEXT) has provided funding for Global Center of Excellence Programs, which are interdisciplinary research projects designed to support the development of creative, internationally-minded researchers. Waseda University ranks first of all private universities in the number of programs awarded Global COE funding; its eight programs span diverse disciplines, including chemistry, robotics and politics and economics. In the field of robotics, Dr. Ichiro Kato and his team succeeded in building the world's first full-scale anthropomorphic robot, the WABOT-1 (an abbreviation of Waseda and Robot), at Waseda University in 1973. The team has continued to carry out pioneering research into human-like robots, and robotics for application in medicine, welfare and lifestyle. WABOT-HOUSE and the Humanoid Robotics Institute are home to world-leading research on the integration of humans and robots. The University is also home to many other outstanding research institutes which are responsible for unique and innovative research, such as the Tsubouchi Memorial Theatre Museum, dedicated to the memory of Dr. Shoyo Tsubouchi, and the Institute of Egyptology, which is the leading center of Egyptology in Japan. In recent years, the University has been increasingly concentrating on the fields of medicine and health. The Consolidated Research Institute for Advanced Science and Medical Care (ASMeW) was formed in 2004 as part of the MEXT-funded Program for the Strategic Development of Research Centers. 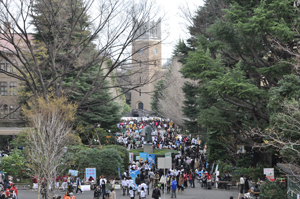 It is the first research unit at Waseda University to tackle the fields of medicine and medical care on a university-wide basis, and brings together health science, biotechnology, welfare engineering, sport science and robotics, as well as other advanced technology from diverse disciplines that meets the Waseda University standard. The ASMeW is particularly focused on health and medical care, with issues such as the improvements of levels of health and quality of life being paramount. The Center for Advanced Biomedical Sciences (TWIns), which is a joint institution with the Tokyo Women's Medical University, was founded in 2008 on the basis of the outstanding body of medical engineering know-how built up over 40 years of collaborative research between the two universities. The Center integrates the areas of clinical medical care and science and engineering in its research. It works to support and foster researchers working in these fields, and generate findings that can benefit society. Waseda University welcomed its first international student in 1893, and today its vibrant student community is enriched through academic agreements and researcher/student exchange agreements with around 600 universities and higher education institutions around the world. 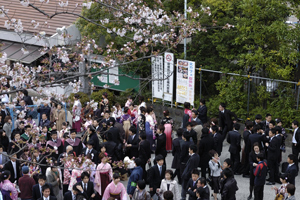 As a result, there are around 4,000 international students currently studying at Waseda University. As of 2009, Waseda University had the highest number of international students of any Japanese University, public or private, but the University is committed to increasing this total, eventually doubling it to 8,000 international students in the future. In 2010, the University launched on a university-wide basis English-based Bachelor and Master's degree courses in five Undergraduate Schools and six Graduate Schools. Moreover, a new graduate school, specializing in English-based international communication, will be launched in 2012. 1838-1922. Born in Saga. A prominent statesman, Okuma worked as Minister for Foreign Affairs, Commerce Minister of Agriculture, Prime Minister and Minister of Home Affairs. He was the founder of Waseda University and its first President. 1859-1935. A major author, critic, translator and playwright, active during the Meiji era (1868-1912), Shoyo Tsubouchi is particularly renowned for The Essence of the Novel (1885), a literary criticism piece, and the novel Portraits of Contemporary Students (1885). He taught at Tokyo Senmon Gakko, the predecessor of Waseda University, and then at the University itself, eventually as Professor. He is noted for having translated the entire works of Shakespeare, and the Tsubouchi Memorial Theatre Museum is dedicated to him in recognition of this major achievement. 1908-1997. Founded the Tokyo Telecommunications Engineering Company with Akio Morita; the company today is known as Sony Corporation. Ibuka helped to develop the transistor radio and Trinitron television technology. He graduated from the School of Science and Engineering in 1933. Born 1949. Novelist. After winning the Gunzo New Writer Award in 1979 for his debut novel, Hear the Wind Sing, he went on to write multiple best sellers, including the 1987 Norwegian Wood, the two volumes of which sold a total of 4.3 million copies in Japan. In 2006 he was awarded the Franz Kafka Prize, and is thought to be a future contender for the Nobel Prize in Literature. He graduated with a degree in theatre from the School of Letters, Arts and Sciences I in 1975. 1905-1998. Mikio Oda captained the Japanese team at the 1928 Summer Olympic Games in Amsterdam, and became the first ever Asian athlete to win an Olympic gold medal at the same games in the triple jump, with a winning jump of 15.21cm. He graduated from the School of Commerce in 1931. 1904-1997. Chuhei Nambu ranked fourth in the men’s triple jump at the 1928 Summer Olympic Games in Amsterdam while still a student at Waseda University, going on to win the triple jump gold medal in the 1932 Summer Olympic Games in Los Angeles. He also won a bronze medal in the long jump at the same games. Born in 1981. Figure skater. Won the gold medal at the 2006 Winter Olympic Games in Turin, and won the 2004 World Championships in Germany. Graduated from the School of Education in 2004. Born in 1969. Nordic combined skier. Kenji Ogiwara dominated the Nordic skiing events at the 1992 Winter Olympic Games in Albertville and the 1994 Winter Olympic Games in Lillehammer. After retiring, he moved into politics and served as a member of the House of Councilors. He graduated with a degree in sport science from the School of Human Sciences in 1992. 1925-1994. Japan’s foremost pioneer in robotics and humanoid robotics research. In 1973, he succeeded in creating the world’s first full-scale anthropomorphic robot, WABOT-1. He graduated with a degree in electronic engineering from the School of Science and Engineering in 1950, then worked as an instructor and assistant professor at Waseda University before taking the position of professor in 1967. 1891-1984. One of Japan’s most recognized architects of the 20th century. His significant works include the Nissay Theatre. He also designed the Kaisuien, a series of pavilions in the traditional Sukiya style of Japanese architecture. He began a degree in electrical engineering at the School of Science and Engineering in 1913 but transferred to architecture in 1915. 1931-1992. Composer. Hachidai Nakamura is best remembered for his hit songs in the 1950s and 1960s, including Ue wo mite aruko (known in English as Sukiyaki) and Ashita ga aru sa. He graduated from Waseda University Senior High School and subsequently Waseda University School of Literature.